The Photoshop In TOP can stream the output from Photoshop CS6 into TouchDesigner. Photoshop can be running on the same computer as TouchDesigner or any other computer on the network. Photoshop can be running on a Windows or Macintosh computer. If the Lock Document Name parameter is left empty, then the TOP will grab whichever document is currently active in Photoshop. To connect to the Photoshop In TOP, a remote connection must be setup in the Photoshop application. Open a file in Photoshop. In the dialog that opens, enter a Service Name and Password. Then turn on the Enable Remote Connections checkbox. Photoshop is now ready to connect to TouchDesigner. The image below shows the Remote Connections dialog in Photoshop. Active active - While on, the TOP will receive data from Photoshop. Address address - The IP address of the computer that Photoshop is running on. If Photoshop is running on the same computer as TouchDesigner, localhost can be used in this parameter. 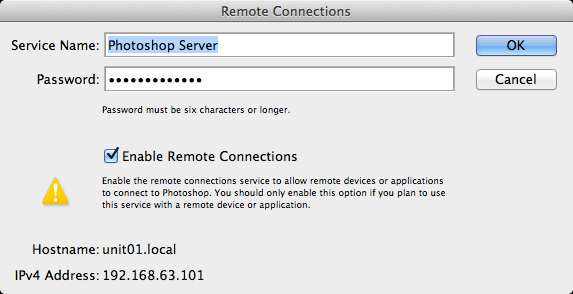 Otherwise, Photoshop's Remote Connection dialog (shown above) will show the IP address required. Password password - Enter the password specified in Photoshop's Remote Connection dialog. Image Format imageformat - ⊞ - Determines what format the Photoshop stream is transferred with. JPEG jpeg - The JPEG image format is will provide better update rates. Uncompressed RGB uncompressed - The Uncompressed RGB format will provide better image quality at the expense of a slower update rate. Locked Document Name lockeddocument - This parameter can be used to lock the Photoshop In TOP's input to a particular file that is open in Photoshop. Lock to Current Document locktocurrent - click this button to lock the Photoshop In TOP's input to the currently active file in Photoshop. Clicking this button fills out the parameter above Locked Document Name. Unlock unlock - Clears the Locked Document Name parameter. When unlocked, the Photoshop In TOP will grab whichever document is currently active in Photoshop. Update Mode updatemode - ⊞ - Determines how the image is updated. Automatic automatic - Will update as fast as possible up to the rate specified by the Max Update Rate parameter. Manual manual - Will only update when the Update button below is clicked. Max Update Rate maxupdaterate - The maximum update rate of the image when Update Mode is set to automatic. Update update - Click to anually update the image.